The first presentation in LaPorte’s Nonprofit Summer Series was on proposed FASB updates for nonprofit organizations presented by Audit Director Dawn Laborie and Audit Senior Manager Sarah Franatovich. 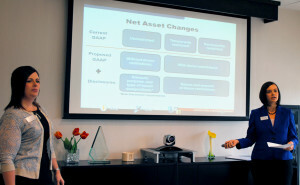 They presented key proposed changes and provided a general understanding of how they may impact a nonprofit organization. Upcoming Nonprofit Summer Series topics for July and August include board governance and nonprofit ethics and the Form 990. Contact a LaPorte nonprofit industry group member for more information.